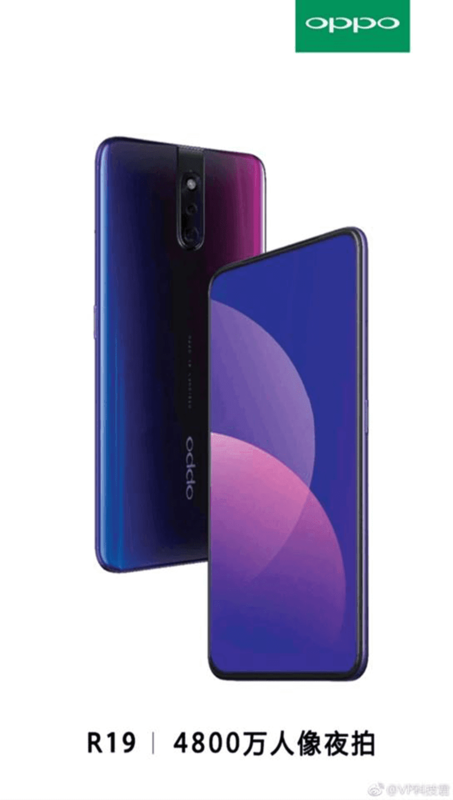 Alleged official render of OPPO's upcoming R17 revealed some of its key designs and features. Like the Find X, it will come with a true full-screen design. As expected, it has no selfie camera in front. It is hidden somewhere. OPPO's design this time could be different from what we saw with the slider of Find X. OPPO will likely borrow Vivo's pop-up selfie camera design found on NEX S last year. R19's design at the back is a bit similar to the Vivo V15 Pro. But unlike the V15 with triple-camera setup, R19 only has a dual-camera configuration. One of those cameras might be a 48MP shooter with pixel binning technology. The leaked render also showed that the phone will sport a twilight-like gradient color design at the back.